Of late, there have been many talking points regarding United States Soccer. The senior team has turned in three straight wins, but they've been largely inconsistent in each of these past performances. Prior to those three matches, Jurgen Klinsmann's teams have been hard to describe. We've yet to see a distinctive style out of the senior team and that might prove worrisome. Their younger counterparts, the U-23's, recently crashed out of Olympic Qualifying in disappointing fashion. The American fan base is lost and lacking guidance. For that guidance it seemed appropriate to a man who has been through it all. Former US National Team star, Alexi Lalas, offers his thoughts on each of these topics and a few more. Enjoy. MLS Reserves: Now that we've all had time to look back at the US U-23's failure to qualify for the Olympics, what are your thoughts? Alexi Lalas: "I don't think my thoughts are any different than when it first happened. It is without a doubt a disappointment and a failure. It is also a wasted opportunity...but having said all that, it is not sounding the death note of US Soccer that so many people make it out to be. There are plenty of lessons to be learned and it certainly may have helped certain players learn and US Soccer learn that was we may have considered talent...we might say that a player isn't as good as we thought." "I'd rather it happen here than at the full international level. I still consider the U-23 team a youth team and a step towards the full international team's goal of winning a World Cup. If that's not the goal, well what are we doing?" 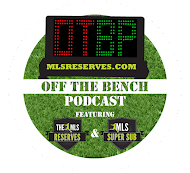 MLS Reserves: Do you think Caleb Porter was the right man for the job? 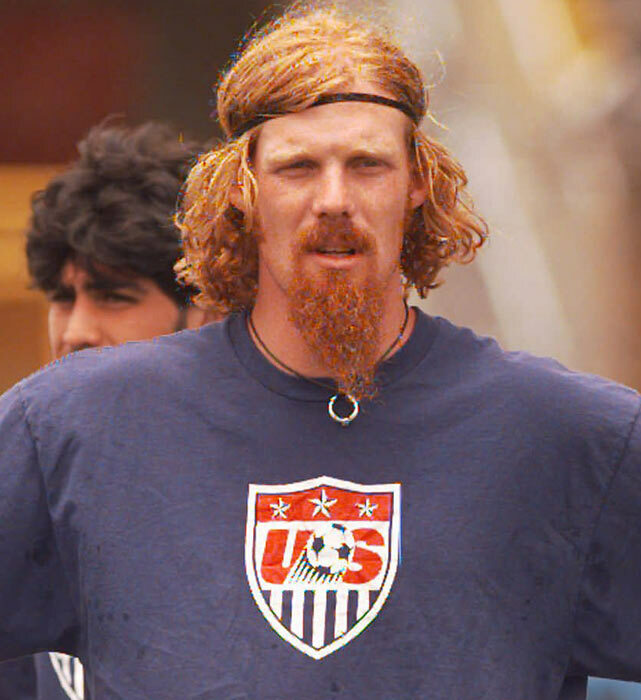 Alexi Lalas: "I have no problem with Caleb Porter being picked. Some people certainly brought up the point that he hadn't coached professionals and that's a legitimate point. I think it's easy to point to his not coaching professionals as baggage for the team not doing well. When things go poorly and we look for reasons, sometimes those reason would be there all along even if things different go poorly. I don't think they're always intertwined with failure." MLS Reserves: It seemed that one of the reasons Porter was chosen were because of his tactics at Akron. Does the United States have the player pool to truly play a 4-3-3? Alexi Lalas: "Everybody has their own personal formations that they are most comfortable with. I'm a proponent of a basic 4-4-2. For many people that makes me simple and uncreative, but I always argue that there is a reason the 4-4-2 has been around for a long time. You can have many more variations within it than people are lead to believe. Formations though...whatever. Having your team be able to play in a cohesive way and having the confidence to play regardless of formation is essential." "What Caleb Porter has done at Akron is build a philosophy is create a professional, rhythmic build up in style. You have to have the right tools and players though to make that effective. Maybe he didn't have that. The fact that both he and the national team is spot on the way it should be. Every single youth team should play the same way as their national team. 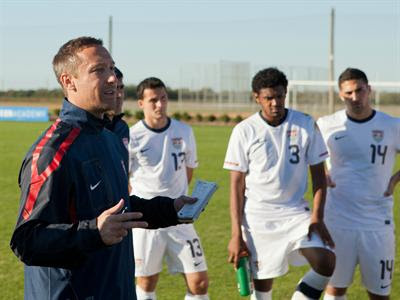 It does no good to ask youth players to play a different system and a different style than what they'll play if and when they graduate to the full national team." MLS Reserves: We know that the plan is essentially to revamp the entire US Soccer System. I've argued that the change should start at the bottom and work from the ground up as oppose to the top down. Should more emphasis be on Claudio Reyna's project and simply task Klinsmann with winning in World Cup Qualifying? Regardless of formation and style? Alexi Lalas: "If that is what Klinsmann position is, then that's what a technical director does, not what a coach does. Look Jurgen is a friend of mine and I respect him, but ultimately he's going to be judged by what the national team does and that should be his priority. I do feel that he's very comfortable recognizing that he may not be around to see some of what he's working towards come to fruition..."
"When it comes to Claudio Reyna and his role with US Soccer, either he's a coach or he's a technical director. So I don't like to see him on the bench. I think that was wrong and inappropriate. I think that being a technical director and establishing a style of play, parameters and a template that you're doing to stick with through thick and thin is part of the job. I think he is also learning what his role is and what he wants to do. But I do think his position is crucial to the future of the US National Team's future." MLS Reserves: The United States senior squad has won their past three matches under Jurgen Klinsmann. However those performances have been inconsistent at best. Is Jurgen's "plan" working? Alexi Lalas: "I think that there is a bread and butter that we're going to always revert to. I don't think that ever should be lost [set pieces] are a powerful tool. However, to be have players on the field from 1-11 that are comfortable on the ball, that are able to play under pressure, that are able to withstand pressure and are able to establish a rhythm: that's the goal. Is his plan working? The jury is still out on what his plan is!" "Generalizations and big sweeping statements, well I want to see some of the meat. I want to see something that I can point to and see his plan happening. I know that takes time but it's not unreasonable to ask. Maybe the ultimate judgement is when the team is in the World Cup and we see the team do something where four years ago, that wouldn't have happened....But I don't know what that is!" MLS Reserves: Play coach/commission/president for the moment. What changes would you implement to make the United States more globally competitive in the game? Alexi Lalas: "I think that at a certain point there needs to be a public recognition that in order to take two steps forward, we might need to take one step back. That means coming to the realization that we may sacrifice some short term gain for long term success. That means we might implement a way of play that will win us in the long term. We might lose some qualifying games, we might even fail to qualify and for me that would be hard to swallow." MLS Reserves: Wouldn't that be a disaster? 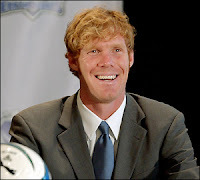 Alexi Lalas: "A disaster? Not if it meant four years later, not only did we qualify but we came with an ability to compete that could last us for the next fifty years!" MLS Reserves: I get what you're saying but it's almost shocking to hear about us missing this cycle, missing out on Landon and Howard in this next cycle..."
Alexi Lalas: "I'm not saying that's what would happen, but with the progress that we're making, which should not be discounted, we can continue on the road we're going. In the United States though, we're never satisfied. In order to get to where people want us, whether its realistic or not, we may have to break things down a bit in the short term for some long term goals." Alexi goes on to describe a vision in which the United States back line is so comfortable on the ball, that they never punt the ball, ever. They are so comfortable while under pressure that they are able to pass and move with poise, denying their opponents the ball, despite being in their own end. It is a powerful vision. In a bit of irony, we are interrupted by Alexi's son in the background, to which Lalas quite bluntly says: "Henry! I'm talking about your future alright?" What could be more perfect than that? MLS Reserves: Lastly, it has been announced that the classics rivalry with Mexico will be resurrected and you'll be participating in a match with alumni of both teams. Can you talk about that? Most importantly, will Eric Wynalda score? Alexi Lalas: "So lets take the last part first. Eric Wynalda, regardless of if he scores on the day, will find a way to manipulate the message so that everyone think that he scored, that he captained the team and carried the squad on the day! That's just what Eric does! Haha, for the last decade we've not had the Eric Wynalda experience and now we have a chance where he gets to run around and kick a ball against a Mexican team, so he'll be completely in his element! It would not surprise me if he scores...but it would also not surprise me if he pulled a hamstring. But the message the following day will be that he was the savior and doing incredible things on and off the field!" He said he'd be back. "Haha, as for the actual game: for those of us who have grown up in US Soccer, the rivalry is legendary. It is always something a little extra with USA/Mexico even if it's a bunch of guys running around trying not to pull muscles. The reality of 2012 is that Mexico has bested the US at every level from youth teams on up to the national teams. This is our chance to have some sort of dignity and honor restored! One thing we cannot let happen is let Mexico retain the title of Legends! We must still dominate!" 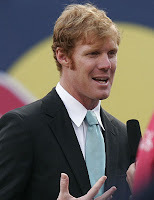 It was a fantastic interview, as they often are, with Alexi Lalas. Strong words for the national team program and ideas to solve the riddle of winning. Do we need to take one step back before taking two steps forward? Perhaps so. Most importantly though in the short term, Eric Wynalda MUST score against Mexico. Great interview Luke. Especially like Lalas' opinion on the possibility of maybe having to take "one step back" in order to take two steps forward. Great work! I imagine you go to a lot of effort to put this site together. You should reward yourself by making it as accessible to as many people as possible. Maybe copy and paste to a word document?